Who doesn’t have eyes on Bitcoin today? Have you guys seen the current BTC value against the USD? We would normally think that only the western world has been going crazy with BTC but in fact, the rest of the world has! This is why people are looking for BTC exchange websites around their own region to better understand, get educated, and of course, trade! Today, we will be looking into South Korea’s first virtual currency exchange! We will be looking into Korbit.co.kr, know more about how their website works, what the trading fees are, and get a preview of what their trading platform looks like! Without further delay, let’s talk about that. Korbit.co.kr is founded by Tony Lyu and of course, the company is based in Seoul, South Korea. The company is registered as Cobit Co., Ltd. and is located in 376 5th floor, Kangnam Dae Road, Gangnam – Gu, Seoul. Korbit.co.kr is designed generally like common exchange websites today wherein you get to have an account tier to access different features of the website. This includes deposit/withdrawal restrictions that can be a pain if not looked into before creating an account. How do we create an account with Korbit.co.kr? Click the “Register” button on the upper right-hand side of the home page and this will redirect you to their registration page. Provide an active email account, the reason for your registration and you will receive a confirmation email on the provided address. Now the problem starts here, if you are not from S. Korea, the next step cannot be done since they would ask for a mobile phone that is registered in the region. Good thing that despite the fact that we are not able to proceed with the account verification process, we are still able to explore their website without and look into their features. Aside from the fact that everything in this website is in Korean, we found a few things that might be of interest to you. Here at Korbit, they have a buy/sell stop order wherein you are able to control the outcome of your trade. 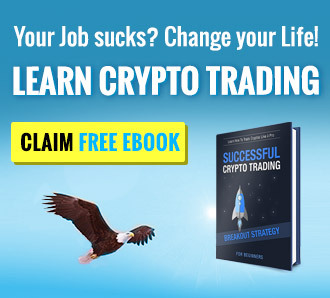 This is not an unusual feature and most of the trading websites today offer this to their traders. You can read more about their STOP-Order feature here. What we found really useful was their search bar on their support page. Unlike recently visited exchanges, they have real answers with explanations! We just need to click the “Translate” button a few times to get an English version of the trading platform since it kept on going back to Korean. Anyways, we’ve got you guys the preview of their trading platform, all the magic happens on this tab. We can see on the left-hand side panel of the trading page are the pairs that you are able to trade with. These are cryptocurrencies that are going to be paired with their own currency which is KRW. On the middle part of the trading platform are the buy and sell order tabs. Provide the number of BTC or crypto you want to trade against KRW, add the order price and that’s it! In general, their trading platform is easy to use and does not have the distractions of some exchange websites have today. Just like any other trading websites, there is what you call makers and takers. Maker orders are orders that are not matched directly with the order book, thus this creates a new entry and provides liquidity for the market. On the other hand, we’ve got Taker, which is an order that is immediately matched with an order listed in the order book; this also takes away liquidity from the market. Trading fees depend on the volume of trade that is being made within a 30-day period. If the volume is below 100 million KRW the maker fee is at 0.08% and the taker fee is 0.20%. The higher the volume, the lesser fees are being required. If a trader reaches a monthly trade volume of more than 100 Billion KRW, then the maker fee would be FREE and the taker fee is at 0.01%. 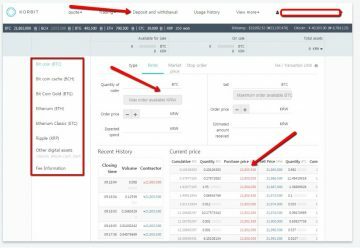 Exchange websites such as Korbit.co.kr that have this fee schedule are the websites that welcome whales to trade. Whales are big spenders that usually trade billions of KRW worth of BTC per month. Here at Korbit.co.kr, they accept fiat and crypto payments without any problems at all. All you need to do is require certain account levels to unlock different tiers of services. Depending on the level of account a user holds with Korbit.co.kr, they would have different deposit/withdrawal limits. Basically, users, that have account levels 1 and 2 do not have any ability to deposit/withdraw KRW into their accounts. But these accounts are able to deposit BTC, ETH, ETC, and XRP without any limits. There are cryptocurrencies that have no withdrawal limits for low-level accounts, this includes LTC, XMR, DASH, ZEC, REP, STEEM. For deposit and withdrawal fees KRW, BTC, ETH, ETC have FREE deposits and the fee for KRW per withdrawal transaction is at 1,000 KRW per request, 0.001 BTC for normal and 0.0005 BTC for the saver option. ETH withdrawal fee is 0.01 ETH per withdrawal and 0.05 ETC for ETC withdrawal. Unfortunately, we were only able to touch the surface of the website this means that we are unable to confirm if they do allow Fiat withdrawals to banks outside South Korea. If you guys can confirm this, please do let us know in the comments section below. What’s great is that here at Korbit.co.kr they offer 24-hour support from Monday to Sunday. Customers and can contact them through their customer support hotline 1661-9707 or send them an email at info@korbit.co.kr. This review wasn’t so bad at all. We did have a hard time getting all through the available pages that we were able to get into due to the translation errors that our search engines were going through, but despite that, we were still able to provide a clear idea of what their website is all about and of course, a preview of their trading platform. 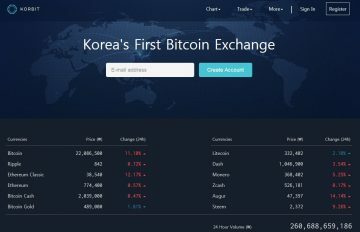 Korbit.co.kr is great for people that are living in the area due to the requirements to create an account and trade with them. For westerners, we suggest reading more about the website and confirm if we are able to withdraw money from their website to banks outside South Korea.